'Tis the season for barbecues, pot lucks and social gatherings. I'm always racking my brain for dishes that can be made ahead of time and don't necessarily need to be heated or chilled upon serving. And on such occasions, particularity when it's hot, it's best to make a dish that's simple and requires no baking. This elbow pasta fits the bill and is oh so delicious with sweet summer tomatoes and a vibrant pesto sauce. You can make it vegan or vegetarian by swapping the parmesan (see recipe below). Alternatively, if you decide to go the vegan route, and want a parmesan without any fuss, just use a mix of hemp seeds and nutritional yeast and a pinch of salt to taste (use a 4:1 ratio; 1 cup of hemp seeds to a 1/4 cup nutritional yeast). Have you seen the tomatoes at the farmers' market recently?! I just introduced myself to a variety called early girl--I just slice them up and eat them plain. I've been buying about three pounds of different tomatoes each week at the market since they've come into season. If the tomatoes get soft or are ready to expire, I cook them down into a sauce or make this pasta. I used cherry tomatoes in this recipe, but feel free to use grape or early girl. If you find some amazing tomatoes at the market that you can't fathom cooking, just forgo that part of the recipe and slice them up, mix them with some good olive oil, salt, pepper and crushed garlic and add them to the pasta that way. Bring a large pot of salted water to a boil and cook the pasta elbows as instructed; then strain, rinse and set aside. Meanwhile heat the tomatoes, olive oil and a pinch of salt in a skillet over medium-high heat. Cover for one minute so the tomatoes release their juices (the tomato water should gently boil). Then simmer uncovered until the tomatoes are tender but still hold their shape; about 5-10 minutes. Turn off the heat and add the minced garlic to the tomatoes and set aside. Alternatively, you can forgo cooking the tomatoes and toss them in a bowl with a bit of sea salt, pepper, minced garlic and olive oil. In a food processor, combine all ingredients for the pesto, except the olive oil. Once the ingredients are well integrated, slowly pour in the olive oil while pulsing. 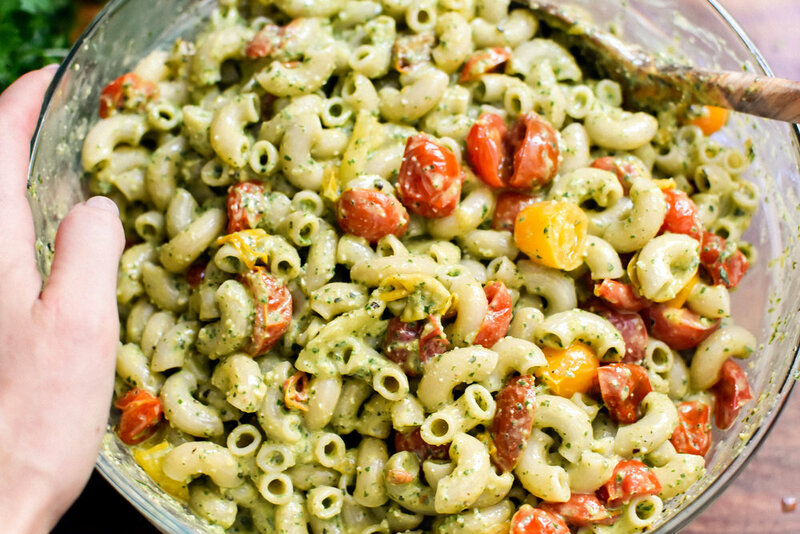 Mix together the pasta, pesto and tomatoes (you can use a spoon to scoop out the tomatoes if there is too much liquid, but some liquid is good) in a large serving bowl. . Taste and adjust seasoning as necessary. Serve warm or at room temperature along with the parmesan of your choice.